This piece was originally written as a chapter for an Academy of Urbanism book. The format of the book has now changed so that the chapter will not be included. I therefore thought it was at least worth posting the material on this blog before it becomes too out of date. It was originally called ‘4 Recessions and a Pottery’ and was inspired by our work in Stoke-on-Trent in the depths of the recession. A much shorter version appeared in the first issue of the Academy of Urbanism’s journal also called ‘4 Recessions and a Pottery’ even after the section of Stoke was edited out so that the title mystified many people. The piece includes case studies of the recessions of the 70s, 80s and early 90s focussing on London, Manchester and Bradford respectively – these are included as separate posts. This introductory piece sets out the central idea that the seeds of urban regeneration are almost always sown during times of recession. The final post tries to apply the lessons to the recent recession. It has not been easy working as an urbanist in a time of recession. In the late 1990s and early 2000s there were plenty of people who wanted to build things, land values were positive and change seemed possible even in the most deprived urban neighbourhoods. The job of the urban designer was to mould and shape this development pressure into successful urban areas. It was therefore quite a shock in the autumn of 2008 to see this development pressure evaporate overnight. Suddenly no one wanted to build anything, and the notion of masterplanning seemed slightly absurd. The question became not, how can we shape development, but how can we make something, anything happen? However a lack of demand to put up new buildings doesn’t mean that nothing is happening. Just as the harshest eco-systems often have the richest ecology so in the depths of recessions all sorts of community and economic activity can grow and develop in a way that is impossible during economic upturns. The sustained economic upturn in the fifteen years leading up to 2008, a period when we had apparently abolished ‘boom and bust’, means that many planners architects and urban designers had never experienced anything different in their professional lives. However for those of us who are a a little older, the frustrations of working during a time of recession have been reminiscent of our formative years as professionals. For me I am reminded of the dark days of 1979 when I moved to Manchester to study planning and again of 1990 when I started working for URBED. Rather that the grand masterplans and iconic architecture of the 00s the 1980s and early 90s were all about working incrementally, stimulating grassroots activity, bring buildings back into use bit by bit, promoting ‘meanwhile uses’, working with artists and independent businesses and using festivals and events to generate interest. There are many parallels with what we and many others have been doing for the last five years. It is difficult and messy work and much harder to do in today’s risk-averse world than it was in the early 1990s. However it goes back to the roots of why I got involved in urbanism. So in October 2010 when I was asked to present a paper to a conference in Bradford being organised by Beam on the theme of Creativity & Regeneration in the New Economy it seemed a good opportunity to explore the link between recessions, urbanism and diversity. Once I started looking into it, it occurred to me that many of the urban places that I most enjoyed, and many of the organisations and businesses that I most respected had started life in the recessions of the 1970s and 80s. Received wisdom suggests that these recessions ripped the economic heart out of urban Britain as industries went to the wall leading to mass unemployment, dereliction and urban depopulation. Without wishing to diminish the pain of these recessions, it also became clear that they created space for new ideas to emerge, for diversity to flourish and for values other that the maximisation of profit to take root. Were it not for those recessions we wouldn’t have the cities that we have today. In the following blog posts I explore legacy of previous recessions; the ‘double dip’ recession of the mid 1970s and the way it transformed London, the decimation of the north in the early 1980s under Margaret Thatcher and the way it created the city that Manchester would become and the negative equity slump of the early 1990s and how it almost revived Bradford (but not quite). It is a personal story because the London of the 1970s was where URBED was founded, the Manchester of the 1980s was where I studies planning and the Bradford of the early 1990s was where I worked when I joined URBED to work in Little Germany. The message from these recessions is that they held within them the seeds of recovery. To understand this process let us start by making it personal. What would you do if you were made redundant next week? In the last five years it is something that most of us have had to think about and many have experienced. It’s not something you would wish on anyone, but it has happened to thousands. People react to redundancy in very different ways. To some it is a blow to their self-esteem and financial stability that they never really recover from. To others it is an opportunity to do something different. In a world where new job opportunities are limited this ‘different something’ might include voluntary or freelance work. If that goes well, who knows it could grow into something bigger? Maybe this is the chance to write the great urban novel, to focus on that long-neglected hobby, to do a PHD, to learn how to play the guitar or to get fit. Maybe it is an opportunity to take a lease on that vacant building and let it to people selling alternative clothing (which is how Urban Splash started). People respond in very different ways and while no one welcomes redundancy, for the lucky ones redundancy it is an opportunity to do something new rather than the end of everything. This has economic implications that are relevant to the economy of our urban areas. If you look back into the history of many of today’s successful small and medium sized companies, I suspect you may find a disconsolate person clutching a redundancy cheque. If not this then you might find a graduate unable to get into their chosen profession and dabbling with computers or indulging their passion for music or graphics. When I was first writing this first my son Luca was working 12 hours days for no pay on an independent feature film with a crew of 40 people all in the same position. This is not something that would have happened if they had all been sitting comfortably on the first rung of the career ladder. Many of them today – including Luca – are making a living in film and media in Manchester, most are self-employed or have set up their own businesses and while they may not yet be prospering, they and thousands like them, are at the heart of the city’s future economy. Recessions are incubators of new ideas and business. Figures from the Office for National Statistics shows that while the total number of businesses registered for VAT and PAYE fell by 2.4% between 2009 and 2010 in England and Wales the number of new business registrations per month rose from 32,412 in March 2009 to 40,748 in March 2010 year, an increase of more than 25%. You would think that the best time to develop a new business would be in a time of economic prosperity. It is true that there are advantages in buoyant economies; expanding markets, customers with disposable income and available credit. However the entry costs for new business in boom times can be very high. Premises and employees are expensive the competition is well-established and difficult to dislodge. What’s more, people in well-paid stable employment need a lot of balls to give it all up and strike out on their own. By contrast, someone with a redundancy cheque, time on their hands and few other prospects has little to lose. Gaps are created as established companies contract or fail, and customers shop around for cheaper alternatives to established products and services. Maybe innovation needs the occasional downturn, a brush fire to clear away all the dead wood and allow new shoots to grow. The link between urban decline and innovation has of course already been made. Jane Jacobs wrote that new economic activity can only be created in old buildings. New buildings are too expensive and too regulated in how they can be used, whereas new business needs cheap, flexible, low commitment space. There is also a well-understood cycle in which city quarters that fall into decline attract artists and creative people. These urban pioneers help bring the area back to life but tend to end up being squeezed out by the upsurge in values that they create. The process documented in the 1960s by Jacobs, has recently been updated by Sharon Zukin in her book Naked city: the death and life of authentic urban places. In this she plots the decline, creative colonisation and subsequent gentrification of six New York neighbourhoods and laments their loss of urban authenticity as affluent incomers displace the very independent local businesses and ‘funky restaurants’ that attracted them in the first place. However unlike Jacobs, Zukin sees this as an unhealthy urban process. It is always sad to see a lively creative quarter such as Covent Garden become gentrified, but provided that there are other parts of the city that can be colonised by young creatives the process will roll on, regenerating the city as it goes. The following posts explore this process both spatially and over time showing how recession and urban decline create conditions in which new activity can take root. Just as cities are often regenerated by the activity that comes out of their run down neighbourhoods so city economies are refreshed by activity that starts in times of recession. 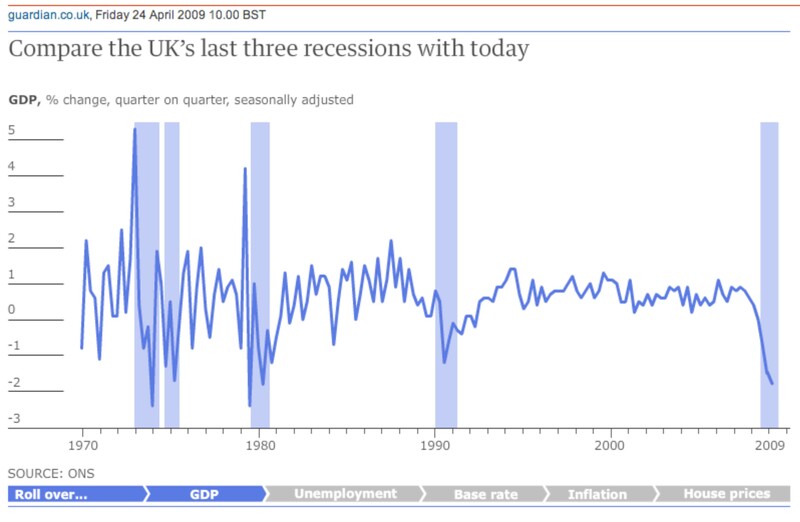 Categories: Four Recessions | Tags: Urban Regeneration, Urbanism | Permalink.